Don’t Forget The Underland Chronicles! Oh, right, it’s called The Hunger Games — and it’s only, like, THE BIGGEST CINEMATIC EVENT OF ALL TIME! But let’s say that your parents won’t let you read the book because it’s for kids ages 12 and up and the story is crazy violent and disturbing. (Cannot argue there. It is. It really is.) Or maybe you’ve already read the whole trilogy and you’re going through withdrawal? Well, I’m here with a friendly tip: don’t forget The Underland Chronicles! What’s not to love? A hidden underground kingdom! A reluctant hero! Giant rats, bats, roaches, and mice! YAY! There’s also a major war going on, an 11-year-old queen struggling with how best to rule, and a lot of the same themes from the Hunger Games books. 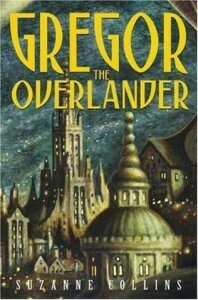 Or, you know, just go out and get Book 1 (Gregor the Overlander) right now! I guarantee that when it comes to the Underland Chronicles, the odds are definitely in your favor. This week, reading fantasy series causes Nancy to question reality and Karen to talk abnormally fast. Plus, we discuss ginormous animals, a secret world under New York City, and endless feasts. If that sounds like a fantasy come true to you, then check out our latest podcast! And when you’re done listening, don’t forget: our next theme is books that have been made into movies! So watch our latest Mystery Book Theater video and check out these great books that have made it to the big screen. Above Us, Olympus. Below Ground, the Underland. In my last post, I railed against the claim that Rick Riordan’s Percy Jackson and the Olympians series is a rip-off of Harry Potter. But I have to admit that when I read PJTO, I did notice some similarities to a different series: the Underland Chronicles by Suzanne Collins. Don’t get me wrong — I am in no way suggesting that PJ is a copy of Underland, or even that one is better than the other. The truth is, PJ and Underland currently tie for my second favorite series (after HP, of course). But I bring this up because I think Underland doesn’t get nearly the attention it deserves, and so there’s a good chance you’ve never read the books. Well, fear not — Kidsmomo to the rescue! I’m here to tell you that if you’re a PJTO fan, you should definitely give Underland a try. A “friend” who betrays the hero at the end of Book 1 Yeah, right — I can’t tell you everything!